This research project is an examination of change in the fundraising activities employed by small Canadian registered charities (defined as registered charities with total annual revenues under $100,000) over the ten year period from 2000 to 2009. Utilizing data from the Registered Charity Information Returns (T3010) filed by charities with the Canada Revenue Agency (CRA), the study provides a profile of fundraising methods used, examining trends in types and number of fundraising methods utilized over the ten year period. We analyze variation in terms of size, designation type (charitable organization/public foundation /private foundation), location (rural/urban), charitable activity (welfare, religion, education, health, benefit to the community, other), orientation (religious/secular), and geographic region (each province and territory, western Canada/central Canada/Maritimes/territories). Brouard, F, Neilson, L, & Armenakyan, Anahit. (2012). 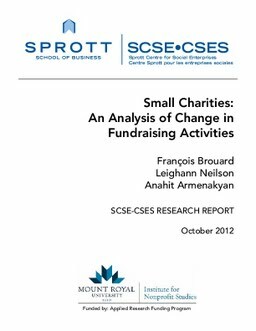 Small Charities: An Analysis of Change in Fundraising Activities.